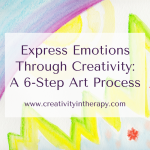 Expressing emotions can be challenging – that’s one of the reasons that art in therapy can be so helpful. 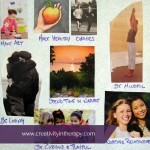 The art process can give clients another way beyond talking to understand and express their emotions. Metaphors and imagery can be powerful ways to convey feelings and gain new insights into them. Using the metaphor of weather to express emotions is one way to do this. I find this directive really helpful for a couple of reasons. First is that it gives a creative way to express feelings on the page. As discussed in previous posts, art about emotions helps clients to build awareness and acceptance of their emotions, provides a safe release and form of containment for those emotions, and gives them reflective distance to explore and understand these emotions. 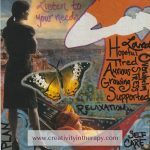 In addition, art done in therapy gives the client the benefit of having their feelings witnessed and accepted by the therapist. Another reason that I like this specific directive for exploring emotions is that the metaphor of weather can lead into discussion about emotions changing over time. When someone is experiencing distressing feelings, it can be easy to feel stuck and think that these emotions will last forever. However, just like weather is always changing, our emotions can always change as well. Sometimes it can be a helpful mindset shift for clients to view negative emotions in this way – they may not always be able to change their emotional weather in the moment, but they can find ways to get through it safely and with hope that better days are possible. One thing to keep in mind is that this directive and metaphor is most helpful if you want to focus on the idea of acceptance of emotions, not trying to change them. We can’t change the weather – we can only accept the reality of it and do our best to cope through it. You can explore with clients what it’s like to accept the reality of the emotion and situation, then look at how can you change your thoughts and actions in responding to that emotion, even when you can’t change the emotion itself. Think about what weather would express how you are feeling today and do an image of the weather. 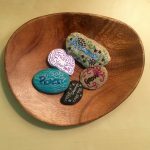 I usually provide a variety of 2D art materials to my clients for this activity – drawing media, paints, and collage material – and let them choose what to use. 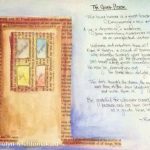 This can be a one-time activity or it could be something that the client repeats several times over multiple sessions or as homework in an art journal. 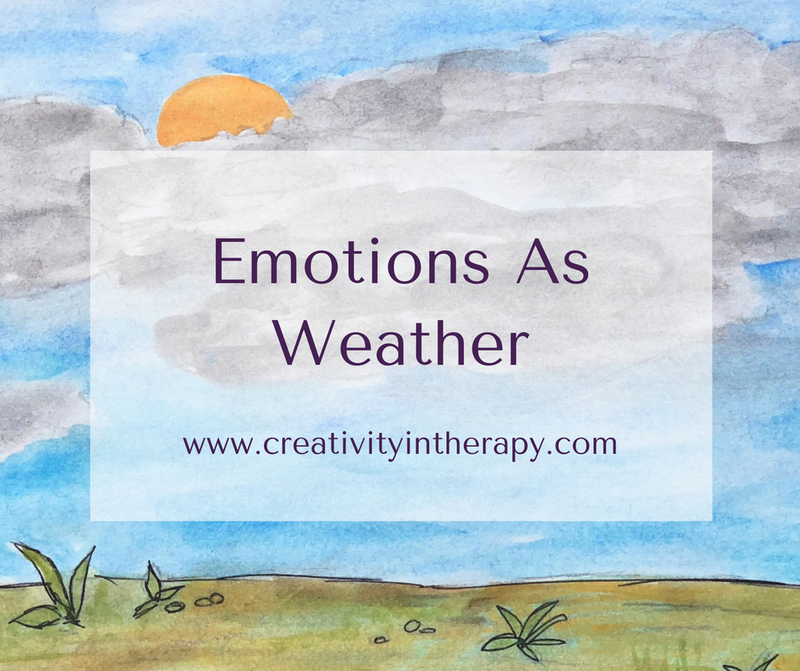 What was it like to try to represent your emotions as weather? Was it easy or challenging to decide how to do this? What did it feel like as you worked on your image and how does it feel to look at it now? Consider exploring the art elements with your client – what types of colors did they use? Is the art piece controlled and structured? Energetic and loose? Chaotic or out of control? Does the metaphor of weather change anything about the way you (client) think of emotions? What can you do to help yourself during this particular emotional weather? 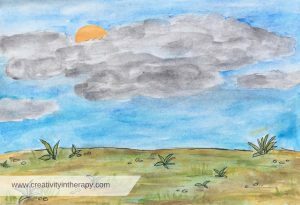 Did you try this art activity in your therapy sessions? How did it go? I’d love to hear your thoughts below. 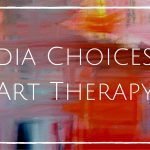 Want more in-depth learning about art in therapy so that you can better help your clients and build your confidence as a creative therapist? 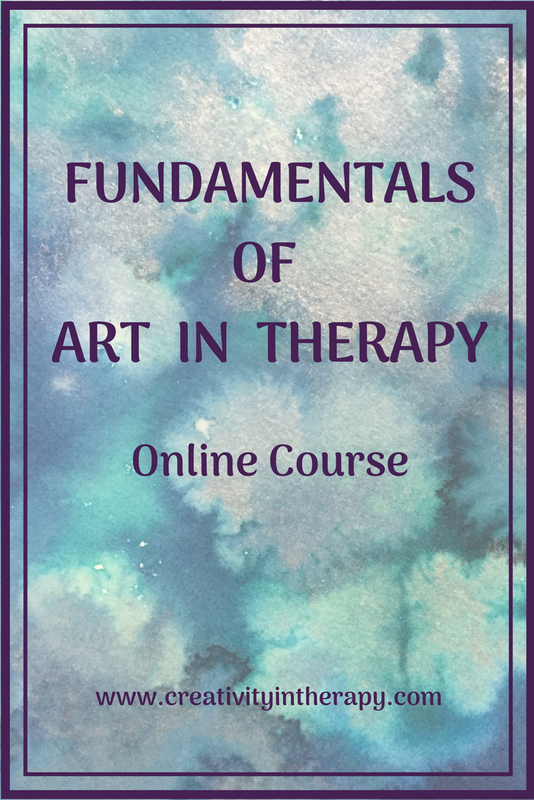 Registration is now open for the Fundamentals of Art in Therapy course. The course starts 6/16/18, so be sure to register before then. Thanks for sharing this directive with us, Carolyn. I plan to use with a client today. I tried the link for the information on the online course, but got an error message that the page no longer exists. Hope it works well for your client! For the online course, I had to change my registration, but forgot to update the blog post. Registration will open May 22nd, so I’ll send out an email with more info then. 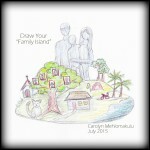 Hi Carolyn, This looks like a great exercise to use. I am a therapist but am currently working on a psych unit doing groups and not seeing individual clients. 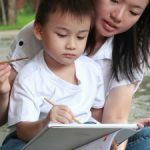 Would the online training you are getting together be beneficial in that setting? Please let me know what you think. Best wishes. Hi Patricia – that’s a great question. I definitely think that the course would be helpful for you to use with clients in that setting. I actually do some inpatient and partial hospitalization groups, so I do bring that experience to the training. Many of the ideas and directives that will be shared can be used with groups (just like this post) and one of the course modules will focus on things to consider for groups. In addition, a lot of the “fundamentals” are important for both individual and group work – how to choose media, how to facilitate the art experience and what your role as the creative therapist is, how to ask questions about the art and understand what is expressed, responding to challenging clients, how different types of art experiences can impact clients in different ways or activate different levels of the brain, and ethics to consider. I’ll send out more info about the course soon! And if you do decide to enroll, I’ll be available for consultation and help throughout, so I’d be happy to share some specific art directives, as well as tips about facilitating art in groups, from my experience with inpatient that might be applicable to your groups. Serendipitous! I was only discussing emotions as weather with a client today. 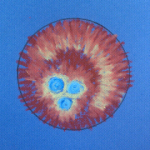 This was after the client had depicted weather on a mask she was painting. I also shared with the client a mindfulness activity I was introduced to recently, where we were invited to visualize ourselves as a mountain, with the weather the going on around us. The essence of the mountain remains the same, and yet the weather changes and swirls around us. We notice the weather, and observe it, without affecting it. Oh, I love that visualization idea. It would be so great to have the client do a piece of art depicting their mountain and weather after going through the visualization exercise. Thank you eager to try this. The part that really stuck out to me in this post is what you said regarding our inability to change the weather. Sometimes we just have to grin and bear it, as is life. Depending on the population you are working with, the client may not be able to control their emotions. However, weather changes and so do our emotions. It can’t be sunny every day and it is important for our clients to realize that is okay. I have used this directive at the place where i am interning at, which is a psych hospital. The patients i work with vary from people diagnosed with schizophrenia, bipolar disorder, borderline personality disorder, and those who are currently detoxing. I felt the patients who were in detox were more susceptible to this directive because they were able to acknowledge their emotions (negative or positive) and how they handle them when “the weather gets bad.” I really like working in the metaphor, but unfortunately that doesn’t always work for people with schizophrenia. Such a good thing to keep in mind that we want to think about which clients this approach would be helpful with. Some clients work well with metaphor and some need things to be more concrete. Some clients really benefit from thinking about accepting their emotions and waiting for them to change; others will need to be encouraged to take a more active role in doing something to change their mood. As you experienced, people in detox and substance abuse recovery can respond well to this directive and a discussion about how to manage their bad weather days safely.